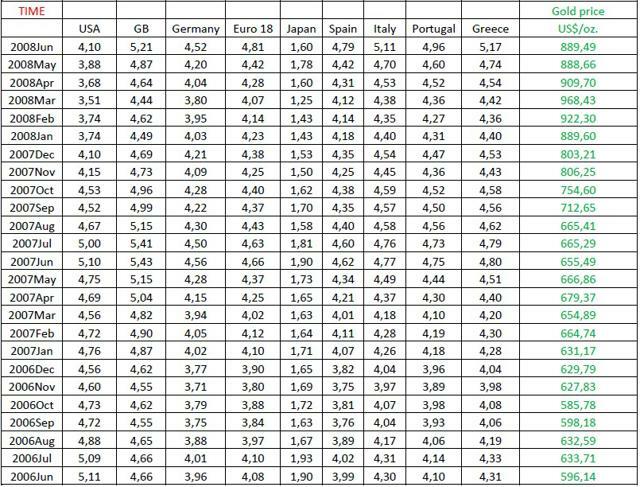 Boris Gerjovič from Maribor, Slovenia, accomplished a thorough examination of the real impact of interest rates on the price of gold. The results may surprise. 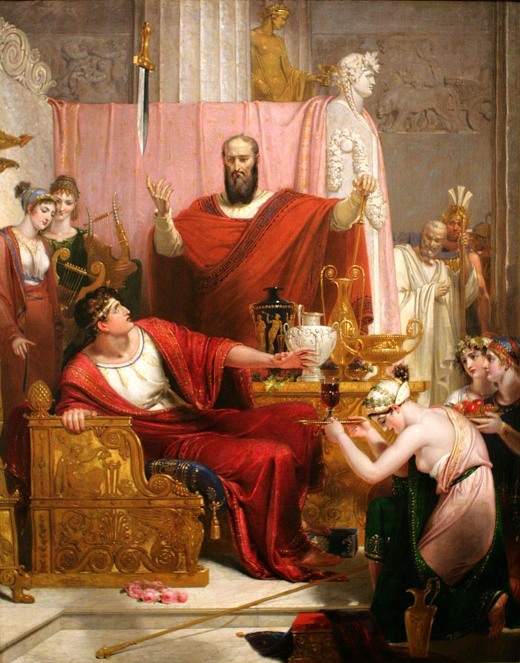 "The value of the sword is not that it falls, but that it hangs threating to fall... Uneasy rests the head that wears the crown!" No matter if Janet Yellen doubles US interest rates next month (from 0.25% to 0.5%), a subsequent fall-back may come faster than many would expect. Gradually rising rates would become unbearable in respect to the weighty debt burden. The Great QE Comeback should take place not later than summer of 2016; in order to be in a dazzling position to win the forthcoming presidential elections in favour of the Democrats. "The path to the truth was long and in our case paved with unbiased research principles... Our intention is actually to show that there is no reason to believe that as a consequence of an interest rates hike there will be a decreasing trend in the gold price. In contrary, the price of gold could even rise and many people could be surprised by this increase." The full research paper, which was written by Boris Gerjovič in November 2014, is reprinted below and can be accesses via this link, whereas it was published on May 23, 2015 by Rockstone Research. In this article we discuss the real impact of interest rates on the price of gold. As it is obviously, there is a lot of talk about an interest rates hike in the media worldwide. As a consequence the decreasing price of gold should follow. However, the task of science is not to repeat what the media have to say, but to put the serious doubt on whatever the media have to say. So, we do believe that the interest rates hike could follow pretty soon, but it´s not the task of this article to discuss if there will be or will not be an interest rates hike. Our intention is actually to show that there is no reason to believe that as a consequence of an interest rates hike there will be a decreasing trend in the gold price. In contrary, the price of gold could even rise and many people could be surprised by this increase. Are we talking only about the gold price in US$, or do we have to believe that the fall in the gold price will be present also if we observe the price of gold in other currencies? 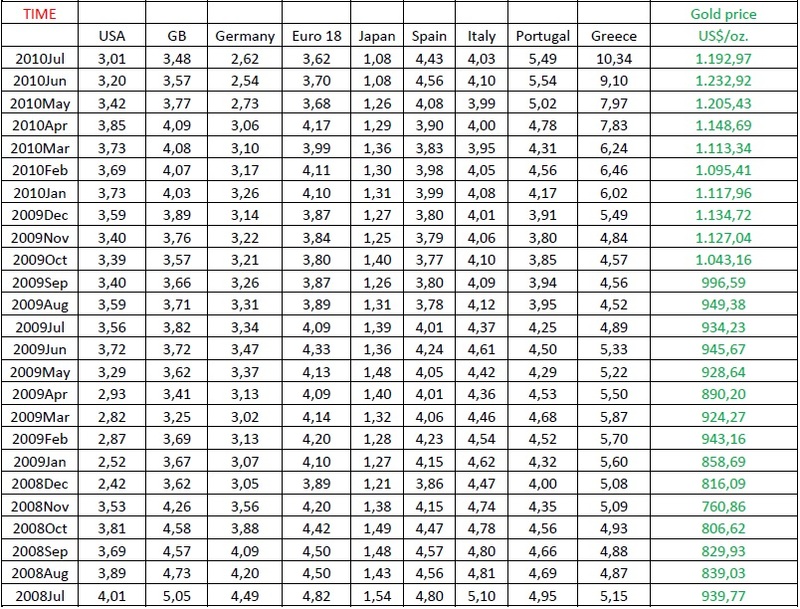 Are we talking about interest rates in US, or/and in GB, or/and in Europe, Japan etc.? Especially American media like to discuss about these issue taking only American market into consideration. FED decision about interest rates hike has been seriously discussed now for more than 18 months and as always there is a repeating press conference statement where it stays clear how we should expect such a move from FED pretty soon. "Increasing interest rates should follow pretty soon" is not telling us enough, because it still remains unclear if we are talking about short term interest rates, or long term interest rates. We could imagine that increase in active interest rates would bring as a consequence also an increase in passive interest rates. And we could even imagine that a move from central bank will be followed pretty soon by the moves from the commercial banks - at least in the same country. However, there is surely the need to express ourselves more clear and concrete when we are talking about an interest rates hike. We could imagine that the worldwide widespread paradigm has find great support in the US, because the price for gold is really settled in US dollars. Higher US interest rates usually lead to stronger US currency and afterwards this could lead to a lower price of gold. In that case the gold is not seen as a safe harbor, but as a hedge instrument for unstable value of the local currency. Usually in the western world nobody else has courage to make the first move and other countries are comfortable to follow USA. This means, that there will probably be an interest hike in the whole western world. It´s more or less clear that in this case China and Russia are not waiting for the FED´s decision. Observing the small fluctuations in economic indicators and the small fluctuations in their interest rates, we can make a conclusion, that economic life in China & Russia is still running independent from the rules of market economy and common economic behavior of the western world. So, we will put them aside of our analysis. The main goal of research in this article is to increase the doubt about the validity of mentioned existing paradigm. It might even occur that we will be able to prove the opposite and it might be that higher interest rates nowadays really lead to a higher price of gold. 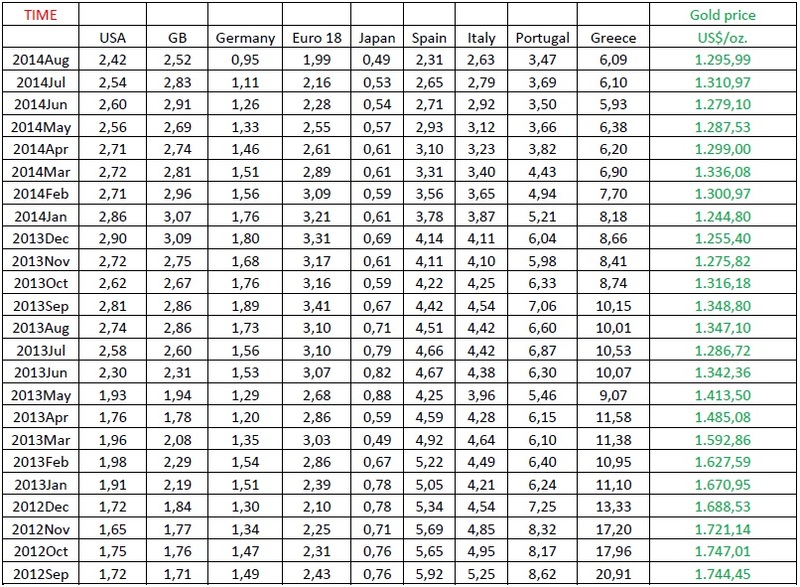 We choose the analyzing period from January 2001 until August 2014. The purpose is more or less clear. This way we include also the 8 months period before the world has faced the fall of New York tweens. To avoid influence of extreme daily fluctuations we use monthly averages of the official p.m. closing rates. 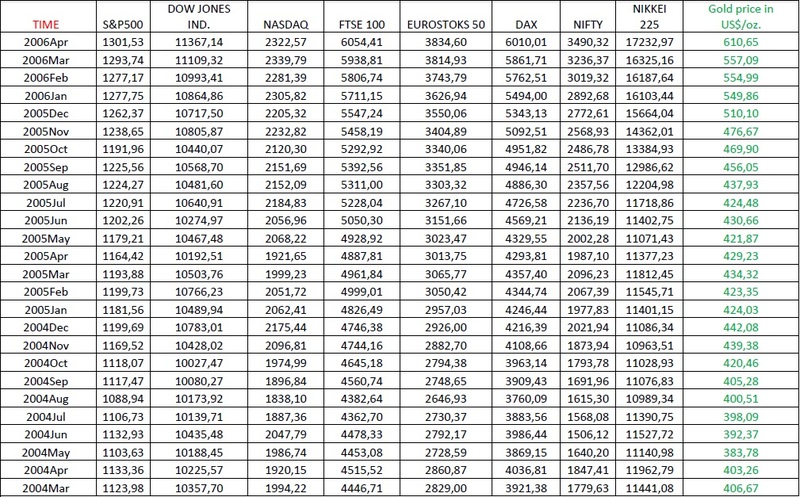 Sources for all data are linked under each table. In the first step we will calculate the correlation coefficients for all parameters observing their directly relation with the price of gold. In most cases when someone conducts similar research, the authors calculate only the correlations for the analytical period as a whole. We will not follow this mistake. The 164 months, which are the subject of our observation, will be divided in 3 separate periods. First period describes the situation from January 2001 until August 2008. We indicate this first period as pre-crisis period. German DAX has fallen in August 2008 from 6.421 points to 6133 points in September 2008 and has continuing to fall further to only 4947 points in October 2008. Recovery did not occur before November 2010 when the DAX for the first time surpassed the level from August 2008 with 6744 points respectively. We indicate the second period from September 2008 until October 2010 as crisis period and the third period from November 2010 until now as post crisis period. Furthermore, our analysis are separated and the results for short term interest rates will be divided from the results for long term interest rates. 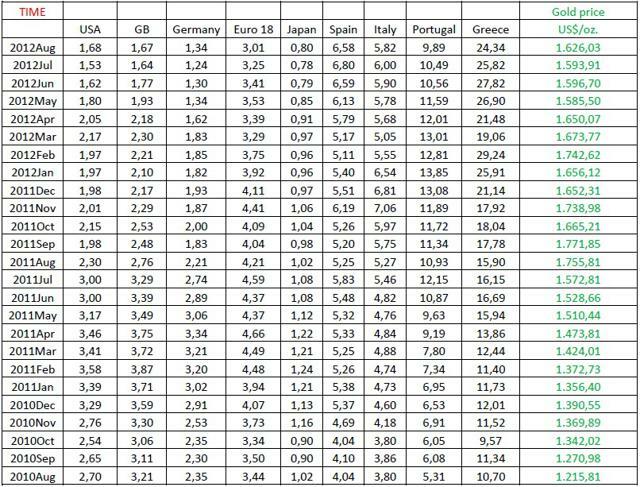 Considering results in the table 2 (correlation between the price of gold and the short term interest rates), people who measure only the correlation for the whole period would say: "The worldwide spread paradigm is 100% valid!" But we are in reality far away from this kind of "truth". There is no prove yet that the price of gold represents the dependent variable, where the chosen interest rate should represent the independent variable. Furthermore, there are no statistical tests, where some kind of significance of chosen variables would be confirmed at least with the p level numbers under 0,05. So, let us continue with the observation of the period No. 1, where worldwide spread paradigm falls totally apart. But then this has turned into another direction inside of crisis period No. 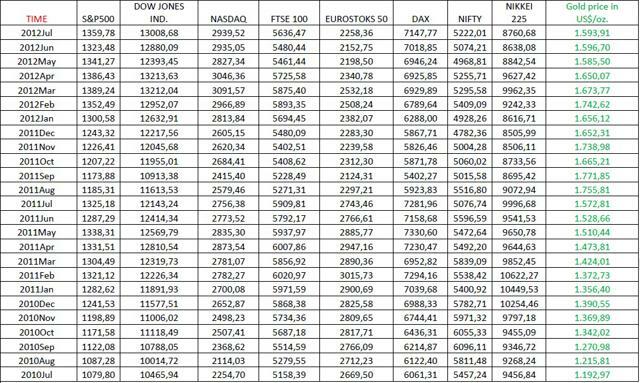 2, where the worldwide spread paradigm seems to find it´s home again. However, the life continues and in the third period the paradigm falls apart again. The problem of worldwide spread paradigm is, that we are actually still living in the period No. 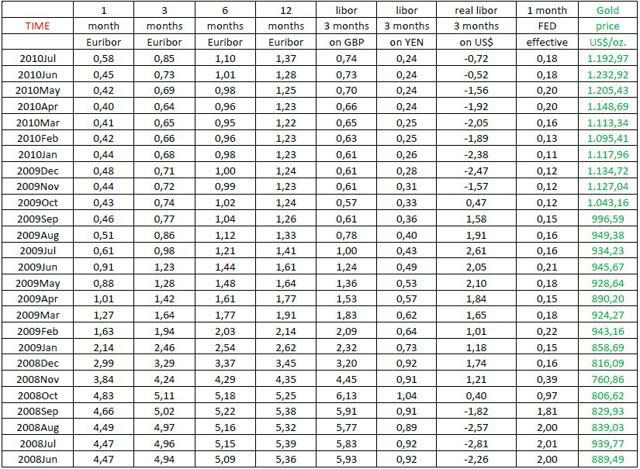 3 and if correlation coefficients are telling us some kind of the truth, then this truth sounds like: In case that there will be an increase of 1 month Euribor (for 1 percent of its own value), as a consequence we will see an increase in the price of gold for 0,34%. 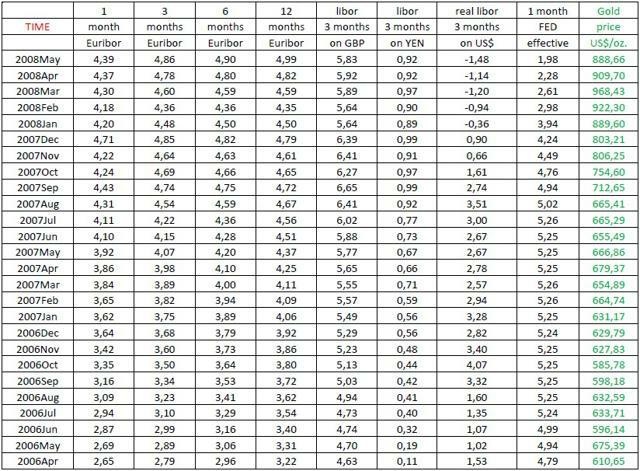 And it´s similar to be seen at almost all short term interest rates with the exception of 3 months real libor on US$ where the real impact of interest rate hike (for 1 percent of its own value) should bring decrease in the gold price for 0,45%. 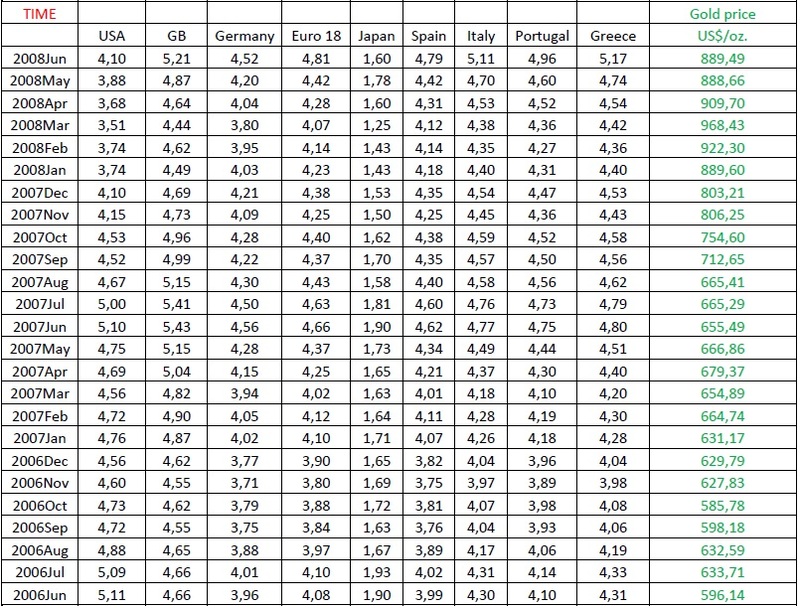 But let us remember how the real rate is calculated. 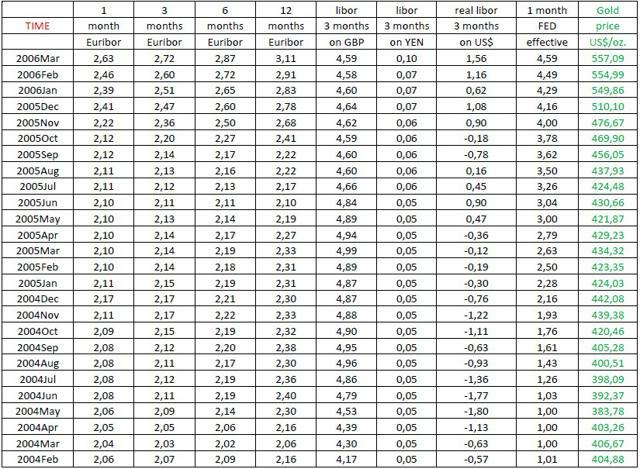 In august 2014 the 3 months libor on US$ was 0,23%, while the inflation rate from august 2013 to august 2014 was actually 1,70% and so the difference is - 1,47%. 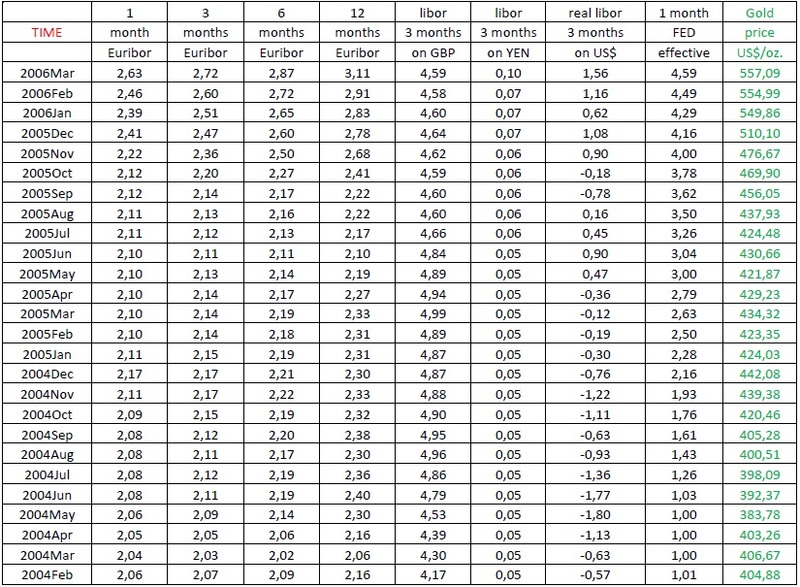 This means that 3 months real libor on US$ is in the reality much more inflation rate as an interest rate. 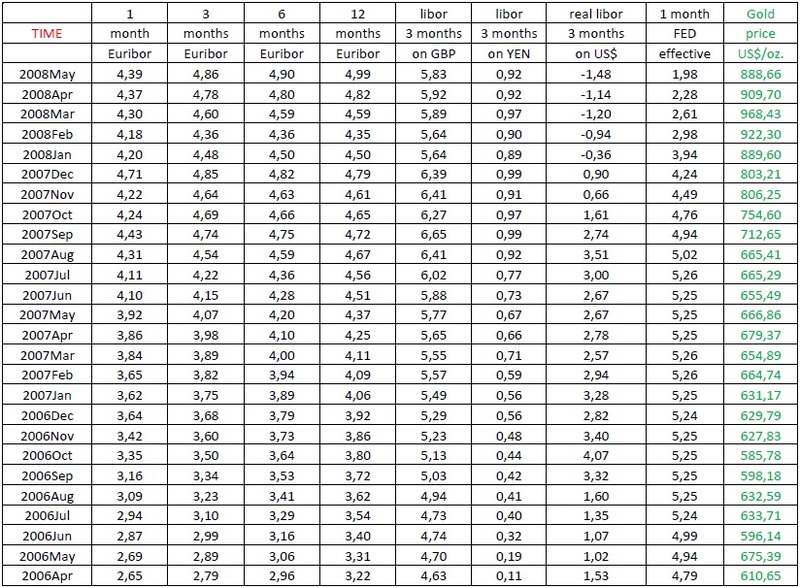 So, let us take a look at the table 4, where analogically to the short term interest rates we analyze the situation with the long term (10 years) interest rates. It doesn´t matter if we observe the whole period, or just the last period. 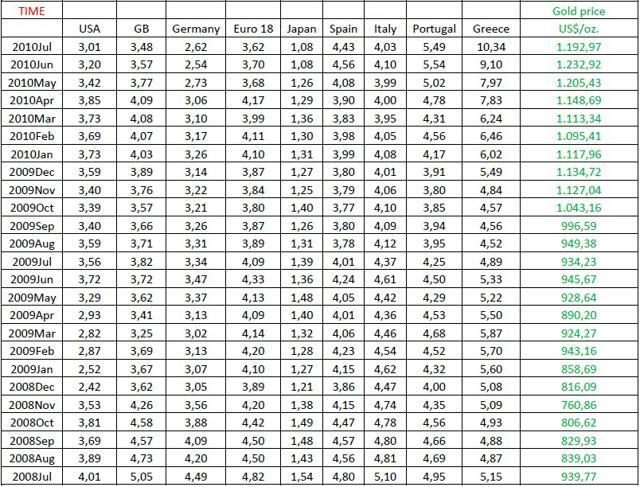 The relationship between long term interest rates and the price of gold is totally different in the United States and Great Britain, as for instance in so called PIGS (Portugal, Italy, Greece, Spain) countries. 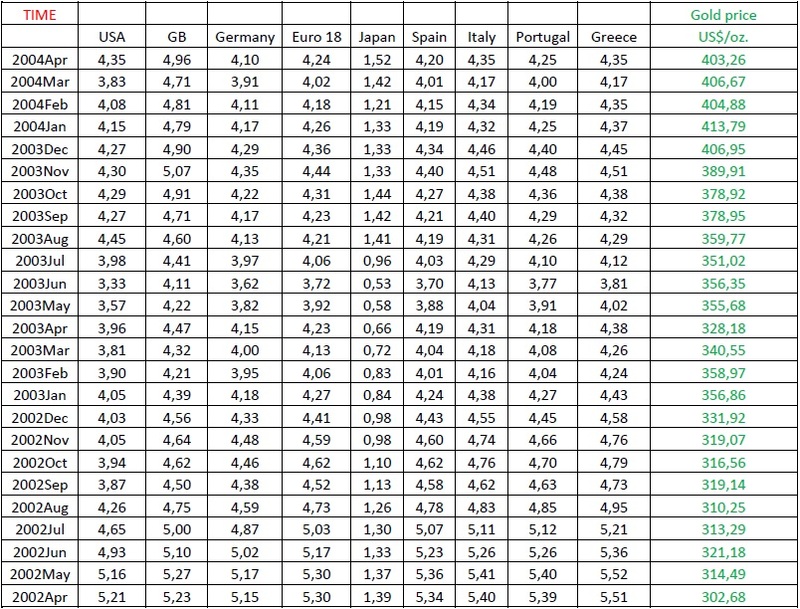 Once again we come to the same conclusion, that worldwide spread paradigm could be valid as long as we can limit our thoughts to the US (in this case also to Great Britain), but it´s not realistic to expect from other countries to hold their interest rates untouched observing the capital outflows from their countries to US and to those who followed the US. We did not calculate the averages of correlation coefficients and we did that intentionally. The purpose is pretty clear. We cannot give the same significance to Portugal and to USA. 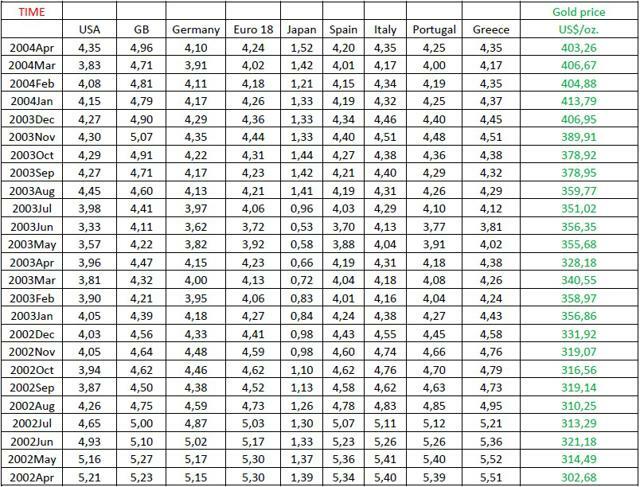 So, we have to admit that in the case of long term interest rates there is obviously greater probability for the validity of worldwide spread paradigm, as in the case of short term interest rates. But let us continue, because this type of research cannot take only one separate factor (in our case interest rates) into consideration. 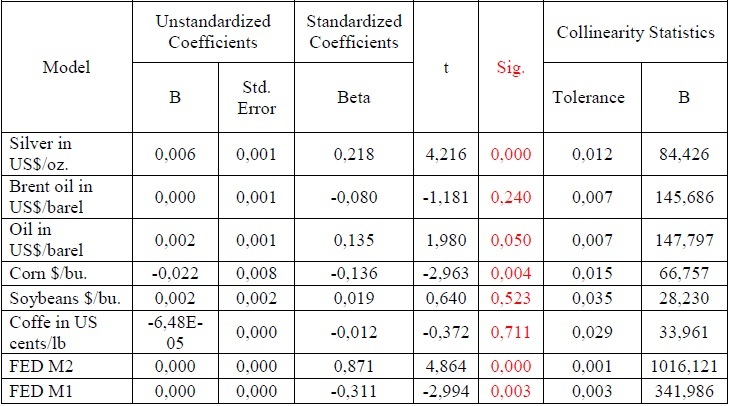 Searching for the prognostic model and trying to implement multiple regression analysis by using the SPSS software computer program, we have come to the following table 5 on the next page. I have to admit that it looks pretty complicated, but we don´t need the perfect statistical knowledge to understand what is really important to understand - and this is just the red column, where Sig. is a sign for significance. 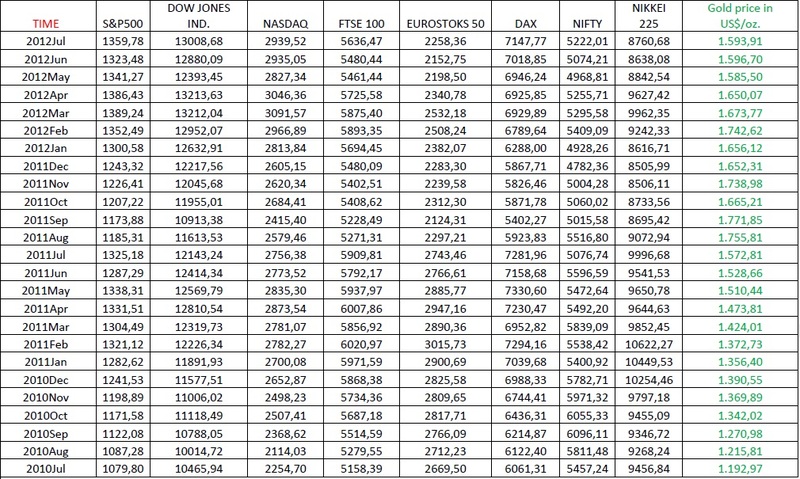 All 18 factors in the left column have showed a great direct correlation with the price of gold (min +/-0,84). However, the Durbin Watson value was less than 1 (actually it was just 0,746). 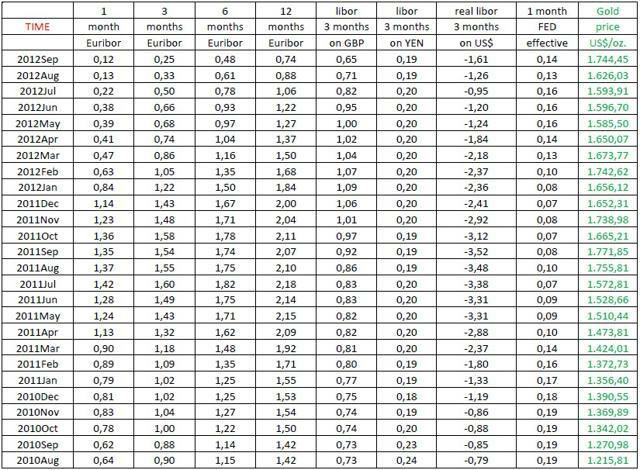 This means that these 18 parameters are not only highly directly correlated to the price of gold but also highly directly correlated between themselves, which was the main reason why we implement a logarithmic transformation to enable some kind of realistic approach to multiple regression analysis. 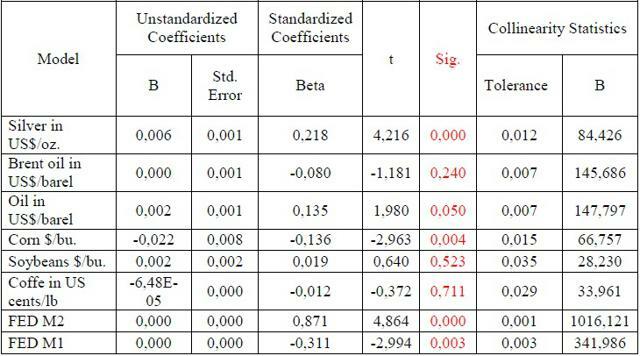 But the results confirmed that multiple regression analysis is surely not appropriate method in this case. However, trying to create a prognostic model, a computer program marked (in the red Sig. 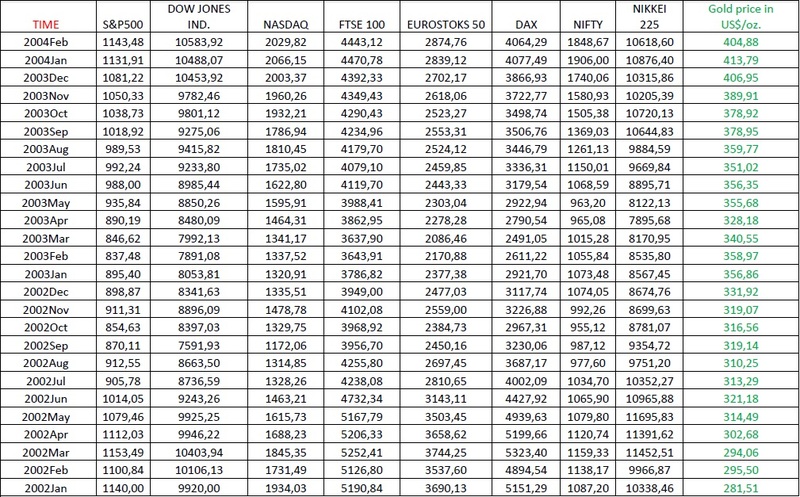 column) the value of Indian stock index NIFTY, currency relationship US$/YEN, price for silver, price for corn and the value of FED monetary aggregates (M1,M2) much more significant as long term interest rates. The numbers in Sig. column represent the p value and this number exceed the value of 0,05 exactly by the long term interest rates, Despite the highest direct correlations to the price of gold (in our table No. 4), it might be that the long term interest rates have no significant impact on the price of gold at all. The only exemption could be the US 10 year interest rate with p value 0,027. Once more: this number is (from the long term interest rates) the only p value under 0,05, which is the limit of tolerance where the statistical science is still prepared to acknowledge the significance of observed parameter. 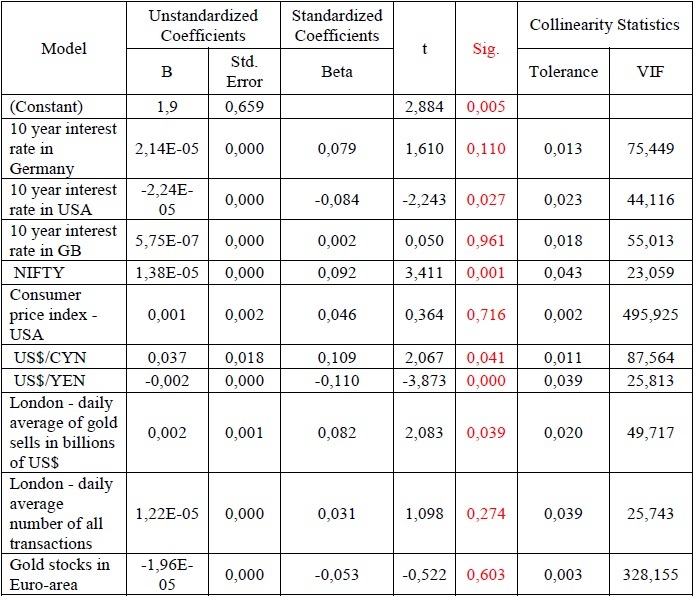 In search of a successful prognostic model we also used a stepwise method by shortening the mistakes between forecasted gold prices and the real gold prices, which followed one month later. 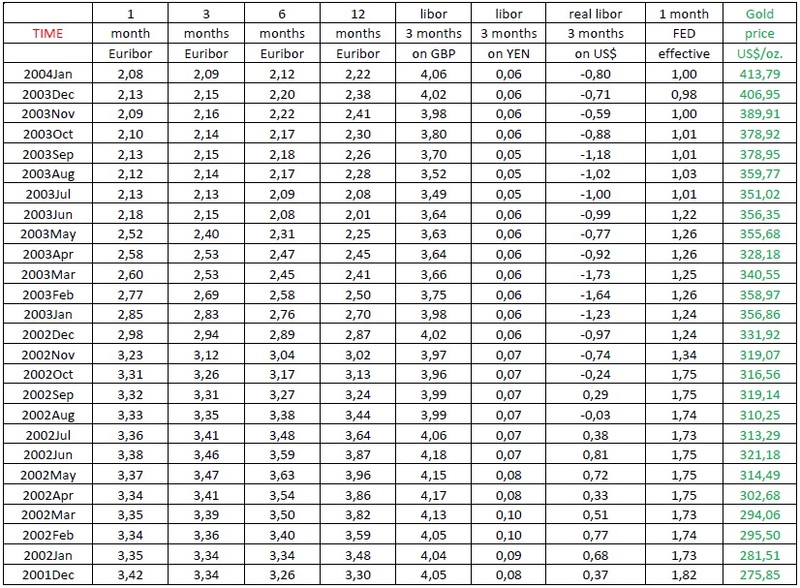 And in this case, where the direction of the future movements in the gold price was predicted correctly 35 times in a row (each time from the average price in the current month to the average price in the next month), the greatest importance in prognostic model (similar as when the computer chooses the valid parameters alone) has not been given to the long term interest rates. I have no time and place here to introduce the magnificent formula and we will do this on some other occasion. 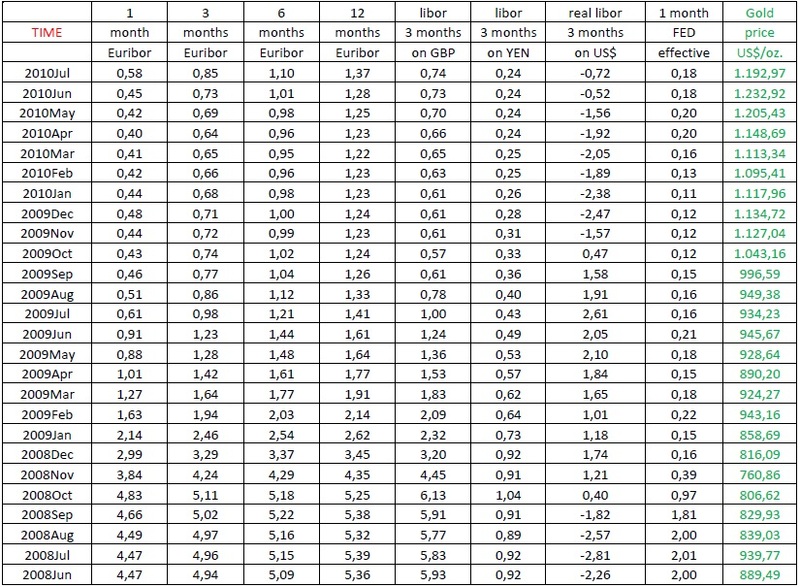 However, I could say that inside of this algorithm the weighting of US$/YEN is over 54%. This means that other, less important parameters, represent all together less than 46%. 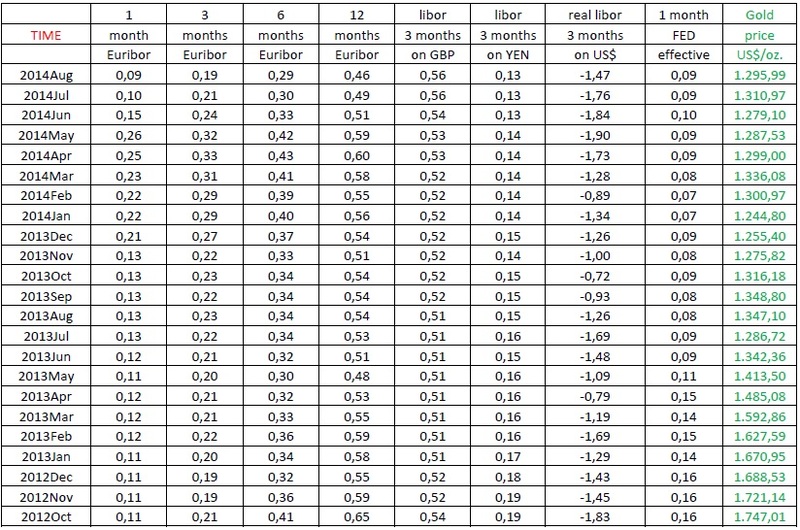 Taking the economic multiplier effects into account, we found that the exchange rate US$/YEN plays a key role in short-term movements of the gold price. Maybe it´s not enough to say that the correlation between the currency pair US$/YEN and the price of gold is in the recent years always over 90% (currently 92% with correlation coefficient - 0,92). 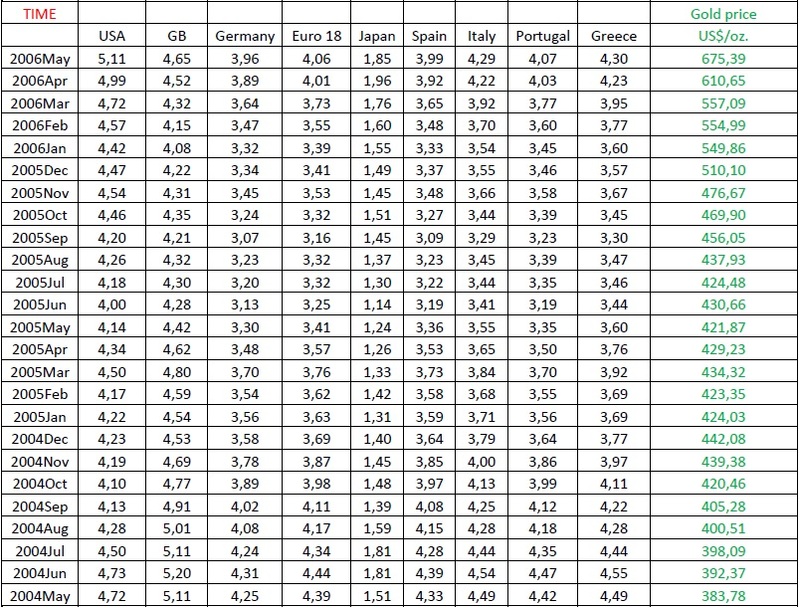 A look back to the table 5 shows for currency pair USD/YEN best possible (100%) significance with the p value 0,000. Furthermore, the gold bulls will never forget a beautiful days in September 2011, when the gold price sometimes exceed the level of 1900$/oz. and the average gold price in this month was 1.771,85 US$/oz. But now I have to add that one American dollar was in September 2011 equal to just 76 YEN and now (November 2014) it´s approaching the value of 120 YEN. 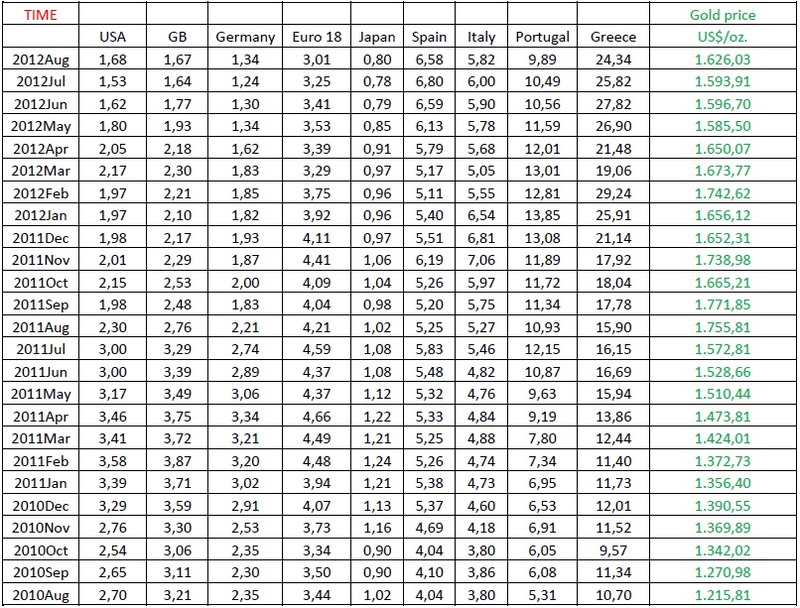 Traders in the US don´t see the value of US dollar the same way as we in Europe. The relation to Euro is for them less important. And so the computer trading programs are prepared to react whenever the Dollar gets stronger or weaker against the Japanese currency. Facing the reality of the latest Japanese economic disaster, there is a reasonable question: How long can the fall of the YEN continue? And I think that is not pretty long. We are already facing the fact that the rest of the world is losing their market positions on what has been left from the Japanese market. But the greatest threat comes from Japanese exporters, who enjoy in a paradise of a falling YEN and they can actually approve new discounts to their foreign customers on a daily basis. This story will come to its end, when somebody clever enough will ask himself: "Why have we in the US spent billions and billions of Dollars in order to save our automotive industry?!" It might be that the price of gold will fall for 0,65% if there will be an interest hike at long term interest rates in the US for 1% (for instance from 2,42 to 2,44%), but this kind of scenario is not confirmed by any kind of scientific approach and will probably not come into place. The fall has it´s reasonable limits in all calculations. So, a 100% increase in US long term interest rates (for instance from 2,42 to 4,84%) should bring 65% decrease in a gold price?! Well, the problem is that at current gold price 1200$/oz. approximately 15% of world production capacities are not able to make any profit at all and 35% cannot make any profit at the market price under 1100$/oz. So, let´s be realistic. The interest rate hike in the US could lead to a lower price of gold. However, if (better to say when) the rest of the world will increase interest rates, we will face an increase of the gold price, which will probably far exceed the previous price level from the time before the US took their first step. Let us explain everything also on the other way. 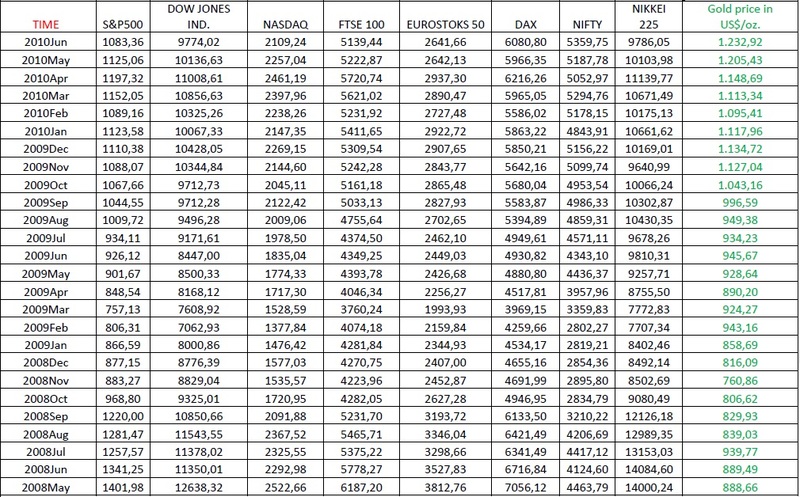 On the next page we have the data for the main world economic stock indexes and the gold price. 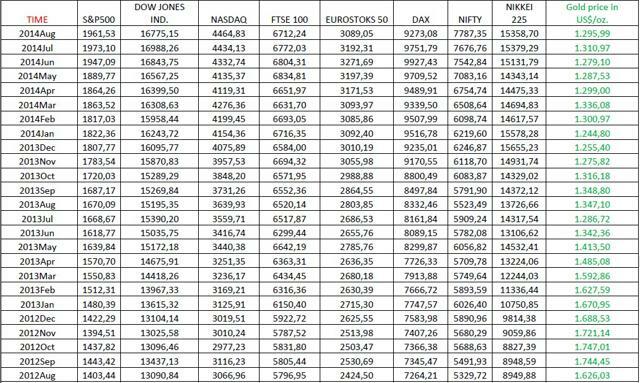 Once again there is a huge difference if we observe the whole analytical period or just the current period (Period No. 3). It´s more or less clear, that nowadays the lower values of economic indicators (stock indexes) lead to a higher price of gold. 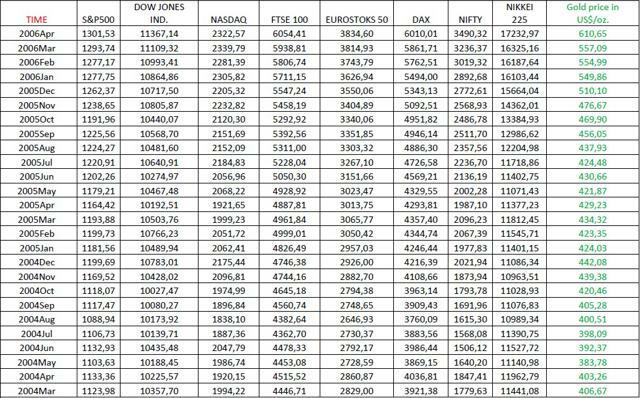 If Dow Jones Ind. falls for 1%, this could lead to an 0,69% increase in the price of gold. 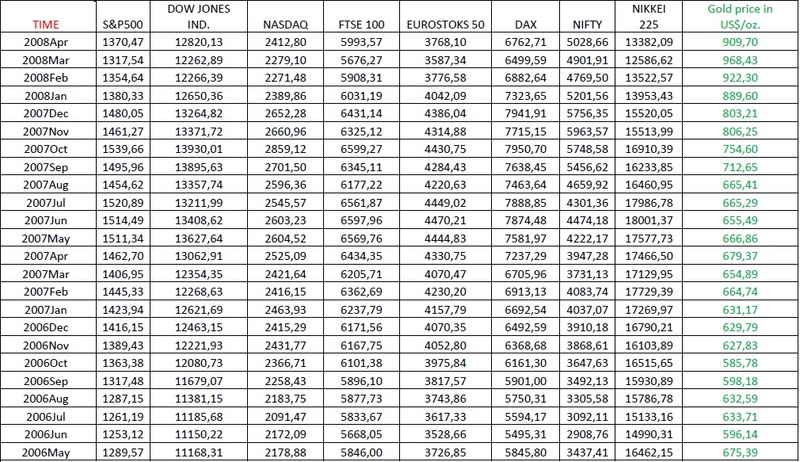 Observing all correlation coefficients in our post crisis period (Period No. 3), there is only one task left. 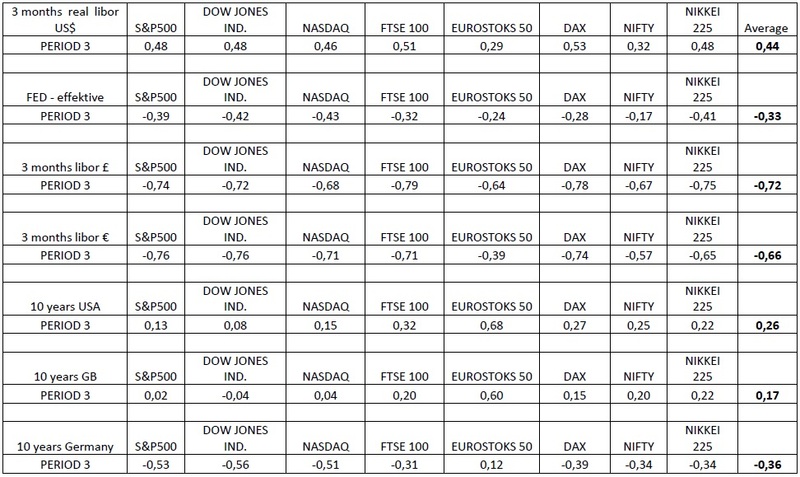 Can we prove that higher interest rates lead to lower values of stock indexes? It seems logical and at this point the traders will usually say: "Yes, because if the money becomes more expensive, we don´t buy shares anymore - we sell them!" But where is the truth? It comes on the next page. 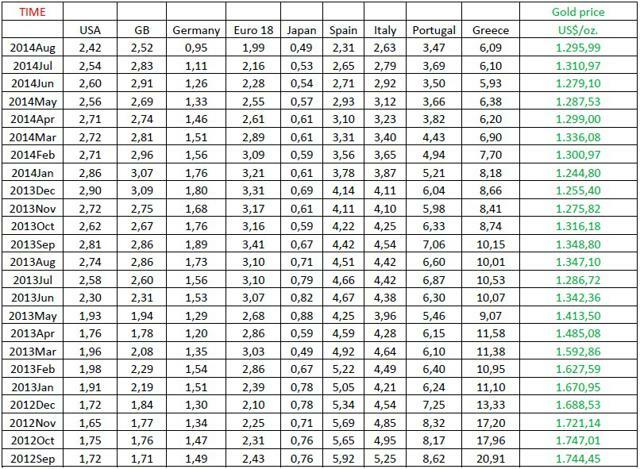 So, let us take a look at the final table 8, where we have correlation coefficients between interest rates and stock indexes for the most important current period No. 3. As we have already explained, the role of 3 months real libor on US$ is in question and hard to compare with other observed short term interest rates. 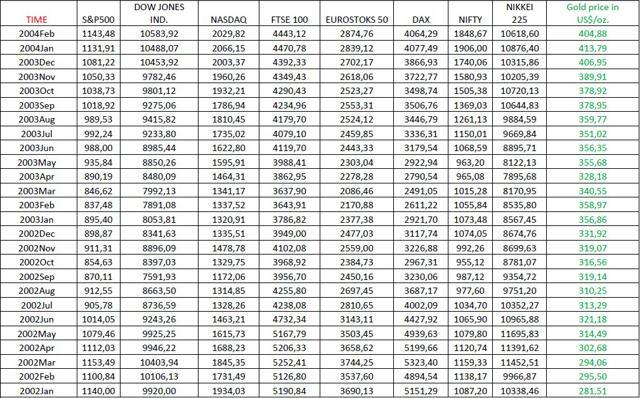 Taking this fact into consideration, we can say that an interest rate hike at short term interest rates will surely lead to a lower values of stock indexes and consequently to higher price of gold. It would be probably enough and more logical to compare the interest rates and stock indexes from the same market. 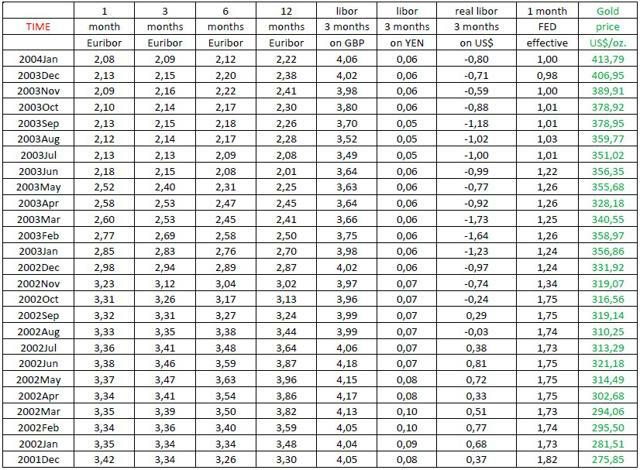 So, in the last row of the table No.8 we can see the fall of the german DAX for 0,39% in the case of german 10 year interest rates increase for 1%. Long term view shows a big difference between Germany on one side and the US and GB on the other side. 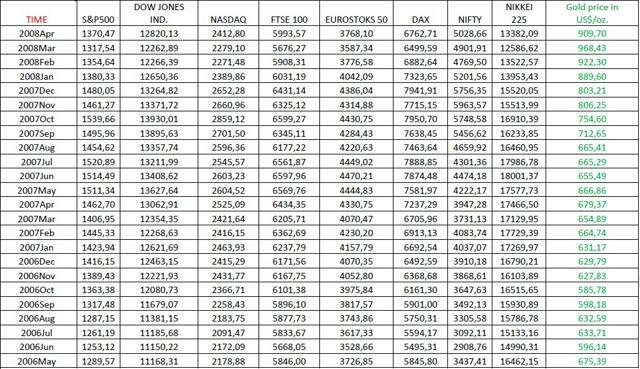 The Dow and FTSE could rise also in case of higher long term interest rates in US and GB. There can´t be any generally conclusion and even if it could be, there is still no prove for one or another thesis. The influence of interest rates on stock indexes seems to be more convincing and more logical, but it might also occur that the central banks cut the rates in the crisis and increase them in circumstances of so called over warmed economy. This means that there is not absolutely clear, what exactly is in this case dependent and what should be an independent variable. The easiest way to resolve such a dilemma is the method of observation. What usually comes first is surely an independent variable. To be honest, I simply believe that shares have gained too much in the recent years and we will be witnesses of some kind of correction pretty soon, especially in the case of higher interest rates. Like the American gold expert Frank Holmes likes to say: There are only two kinds of gold trading: "The fear-trade and the love-trade!" So, I´m asking myself, what are we doing with statistical methods in the kingdom of gold? How can we even measure the fear and love? 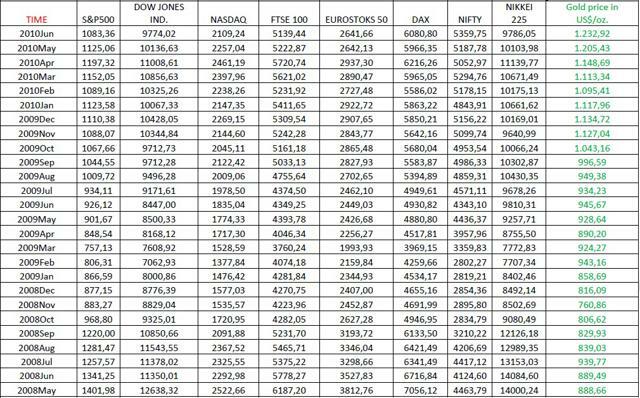 Furthermore, I´m asking myself, what are the gold bears really waiting for? An interest rates hike? Which one? Maybe the one from FED, with the hope that the rest of the world will not follow?! The path to the truth was long and in our case paved with unbiased research principles. As this study did not receive any kind of help or any kind of sponsorship, we can see it as objective. Disclosure is simple. Author holds 34% of all his assets in gold. 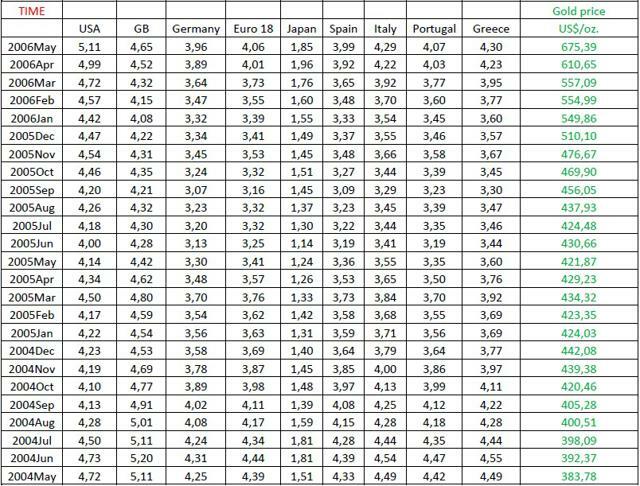 The average price of all shopping activities is 31€/ gram and author is continuing to buy gold stepwise whenever the price level is under 31€/gram (currently around 1200 US$/oz. and the next opportunity to buy at 1150 US$/oz). Data sources are linked under each table. The statement from Frank Holmes was found in the German review Rohstoff Giganten dated April 10 2014. Mr. Gerjovic´s curriculum vitae is available here as a PDF. The exclusive right to the above research belongs to the author, mag. Boris Gerjovič, whereas Rockstone Research serves as publisher. The research paper is made accessible free of charge and as an open file. The research may be reviewed and reprinted, either whole or in part, without prior permission from the author and the publisher as long as appropriate attribution and citation is included, such as "Author: Boris Gerjovič, Rockstone Researchwww.rockstone-research.com"; any reprint must include the original title of the research, the author´s name, and the full text (or a verbatim excerpt) of the research. We would welcome if reviewed or reprinted versions are announced to the author via email boris.gerjovic@gmail.com and/or the publisher via info@rockstone-research.com.